[Hodgson, M. The Venture of Islam . 2. Chicago: University of Chicago Press, 1961. Print. Were Buddhists intentionally mass murdered during the first Muslim conquest of India? Or, were they forcibly converted? Or, was India won peacefully and most of Indus "voluntarily came under Muslim control"? However, before and after the persecution of the faith by Shaivite kings, Buddhism could not be the top religion that could outdo all competitors; pilgrims such as Fahien, Sung Yun, Hui-Sheng, I-Ching, and the monk Hsuan-Tsing reported that Buddhism was on its decline between 400-700 CE. In fact, Hsuan-Tsang wrote that he had witnessed a much greater numbers of non-Buddhists such as Jains and Shaivites than Buddhists in places such as Prayag, Sravasti, and Varanasi, where previously Buddhism was dominant. That "oppressed Buddhist minorities reached out to the Muslim armies for protection against Hindu governors"
That the oppression of the Muslim conquerors (and/or the incentive/pressure to convert to Islam) was 'only' imposition of tribute. Footnotes attribute these assertions to "Alî Kûfi, The Chachnâmah, tr. from the Persian by Kalichbeg Fredunbeg, reprint, Delhi, 1979, p.165"
It agrees with or corroborates the quote in the OP, so perhaps it isn't controversial. At Ar-rur (Rohri) he was met by Dahir's forces and the eastern Jats in battle. Dahir died in the battle, his forces were defeated and a triumphant Muhammad bin Qasim took control of Sindh. In the wake of the battle enemy soldiers were put to death — but not artisans, merchants or farmers — and Dahir and his chiefs, the "daughters of princes" and the usual fifth of the booty and slaves was sent on to Hajjaj. Soon the capitals of the other provinces, Brahmanabad, Alor (Aror) and Multan, were captured alongside other in-between towns with only light Muslim casualties. Usually after a siege of a few weeks or months the Arabs gained a city through the intervention of heads of mercantile houses with whom subsequent treaties and agreements would be settled. After battles all fighting men were executed and their wives and children enslaved in considerable numbers and the usual fifth of the booty and slaves were sent to Hajjaj. The general populace was encouraged to carry on with their trades and taxes and tributes settled. The Arabs' first concern was to facilitate the conquest of Sindh with the fewest casualties while also trying to preserve the economic infrastructure. Towns were given two options: submit to Islamic authority peacefully or be attacked by force (anwattan), with the choice governing their treatment upon capture. The capture of towns was usually accomplished by means of a treaty with a party from among the enemy, who were then extended special privileges and material rewards. There were two types of such treaties, "Sulh" or "ahd-e-wasiq (capitulation)" and "aman (surrender/ peace)". Among towns and fortresses that were captured through force of arms, Muhammad bin Qasim performed executions as part of his military strategy, but they were limited to the ahl-i-harb (fighting men), whose surviving dependents were also enslaved. Where resistance was strong, prolonged and intensive, often resulting in considerable Arab casualties, Muhammad bin Qasim's response was dramatic, inflicting 6,000 deaths at Rawar, between 6,000 and 26,000 at Brahmanabad, 4,000 at Iskalandah and 6,000 at Multan. Conversely, in areas taken by sulh, such as Armabil, Nirun, and Aror, resistance was light and few casualties occurred. Sulh appeared to be Muhammad bin Qasim's preferred mode of conquest, the method used for more than 60% of the towns and tribes recorded by Baladhuri and the Chach Nama. At one point, he was actually berated by Al-Hajjaj for being too lenient. Meanwhile, the common folk were often pardoned and encouraged to continue working; Al-Hajajj ordered that this option not be granted to any inhabitant of Debal, yet Qasim still bestowed it upon certain groups and individuals. After each major phase of his conquest, Muhammad bin Qasim attempted to establish law and order in the newly conquered territory by showing religious tolerance and incorporating the ruling class – the Brahmins and Shramanas – into his administration. This corroborates the claim that Buddhists weren't mass-murdered. However it, to some extent, contradicts the claim that India was won peacefully: if an Indian king or town was defeated in battle then they and their soldiers were killed and their children taken as slaves. The fall of Multan laid the Indus valley at the feet of the conqueror. The tribes came in, 'ringing bells and beating drums and dancing,' in token of welcome. The Hindu rulers had oppressed them heavily, and the Jats and Meds and other tribes were on the side of the invaders. The work of conquest, as often happened in India, was thus aided by the disunion of the inhabitants, and jealousies of race and creed conspired to help the Muslims. To such suppliants Mohammad Kasim gave the liberal terms that the Arabs usually offered to all but inveterate foes. He imposed the customary poll-tax, took hostages for good conduct, and spared the people's lands and lives. So those "Hindu rulers" might have been defeated in battle, after which the populace might have welcomed the conqueror (which corroborates rather than contradicts the claim that "India was won peacefully"). Varna may be translated as "class," and refers to the four social classes which existed in the Vedic society, namely Brahmins, Kshatriyas, Vaishyas and Shudras. I think that suggests that battle, killing soldiers, enslaving their children and so on would have happened to the Indian "ruling and military elite" ... and not to Buddhist ascetics nor to Buddhist lay folk (farmers and artisans). That this was sufficient to convert Buddhists and disintegrate Buddhist monasteries "particularly quickly"
The reasoning implied is that Buddhist monks depend on charity (gifts of food) from lay people. If the lay people Islamify (to avoid jizya) then the monks have no means of support and must emigrate, go hungry, or disrobe. In a comment you wrote, "Mostly the Jizyah was around 5% per able bodied man" but I don't think you can make that assumption. Pages 80 through 90 of ibid say that some people claim there was forced conversion (by force or by punitive taxation), but that this is contemporary bias for which there is no historical evidence. On page 108 it repeats the quote from the Chachnâmah about the tax ("48 dirhams of silver" etc.). Page 125 confirms it's reasonable to conclude that Buddhism (unlike Hinduism) died out in Sindh during the Arab rule (before the 9th century AD). Page 128 says that some Buddhist monks emigrated but it's unlikely that the whole Buddhism population (apart from monks) did: they may have converted to Hinduism but it's likely they converted to Islam. Page 5 through 9 explain what the Chachnâmah is. The invasion was sometimes opposed and sometimes not. Opponents were killed, non-opponents (survivors) were taxed (and, to some extent, plundered). Buddhists didn't oppose the invader/invasion. Buddhists weren't mass-murdered, but Buddhism (not Hinduism) vanished within a couple of hundred years or so. 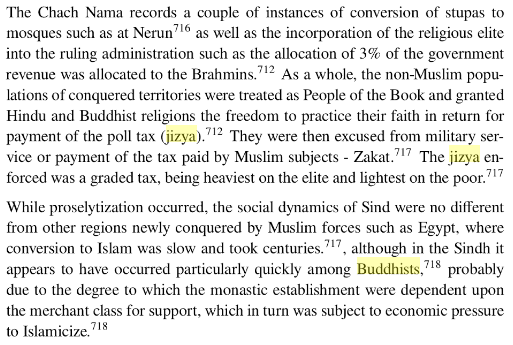 The taxes on non-Muslims (which encouraged people to convert to Islam) may have one of the reasons for the decline of Buddhism at that time, but perhaps there were other reasons too. The first statement in the OP "only Christians and Jews were allowed to survive as dhimmis" is false (if applied to the first invasion) according to Dr. Alexander Berzin's book The Historical Interaction between the Buddhist and Islamic Cultures before the Mongol Empire, where part I chapter 4 is "The First Muslim Incursion into the Indian Subcontinent". Not the answer you're looking for? Browse other questions tagged history islam india . Did India's population decrease “by 80 million between 1000 and 1525” CE? Did the first Mughal emperor of India, Babur, write love poems for men?